The community energy movement of active citizens leading in the energy transition, is very much alive in the Netherlands. The movement that started more than thirty years ago but really took off some ten years ago and has been growing fast ever since. In 2018 number of energy cooperatives has risen to 484, that is 85 more than last year. Interestingly, the movement monitors its own progress yearly. The ‘Local Energy Monitor’ that tracks and traces the activities and projects of citizen cooperatives, was published on 23 November by HIER Opgewekt, a national platform for the community energy movement. The monitor shows how citizens are active in all fields of the energy sector. Citizens organize themselves collectively to share the benefits of energy savings, solar, wind, biogas powered electricity generation, trade and increasingly with storage, district heating, car sharing and other activities. The ambitions are high and so are the stakes. The movement claims 50% ownership of al newly built wind and solar parks and put this on the table in the ongoing national climate agreement negotiations. It is argued that citizens should benefit from renewable energy generation and the profits, and have a definite voice in spatial planning and project development. After all, citizens largely pay for the energy transition with the energy taxes. Needless to say that some commercial developers hold a different view, although many decide to work with the communities. This article summarizes the findings of the Local Energy Monitor 2018. 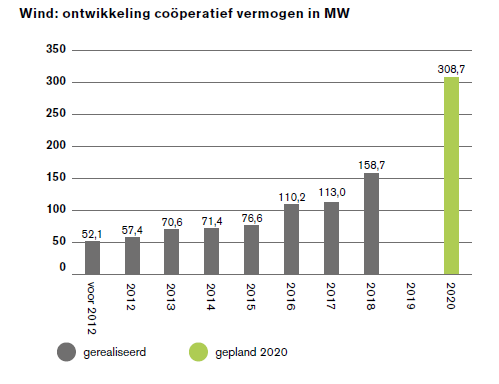 In 2018 484 energy cooperatives are active in The Netherlands, 85 more than last year. One or more cooperatives have been established in two thirds of all municipalities. In the larger cities and municipalities consisting of several villages more than one cooperative is active. 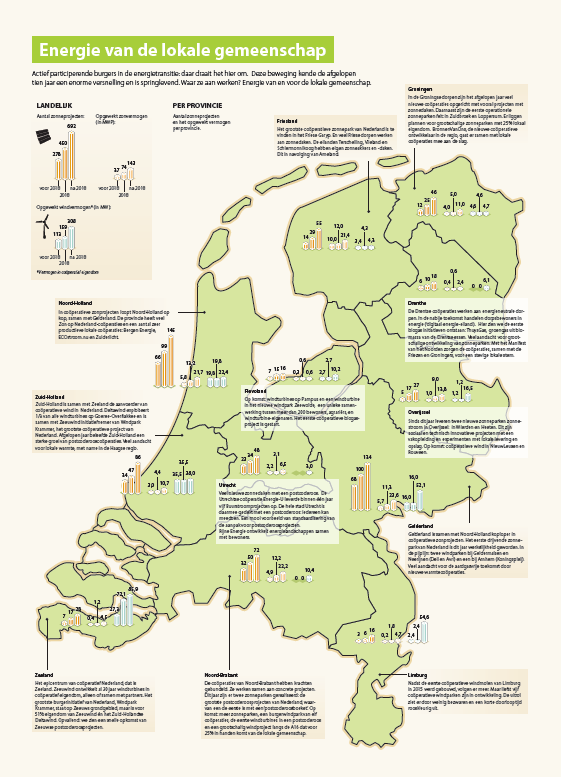 Almost 70,000 citizens are member of a cooperative, amounting to about 1% of all Dutch households. The outreach is larger, considering that all cooperatives want to involve as many people as possible in their projects and plans and use local media to inform their fellow citizens. Effectively, it can be said that the movement existing of many local propagators has been organizing a nationwide campaign for over ten years, mobilizing the Dutch for the energy transition. A campaign by citizens for citizens with a clear aim: local control over energy savings, energy generation and trade with revenues returning to the local communities. Nearly 70% of all cooperatives is working on energy saving, 75% on solar and 20% on wind projects. Increasing numbers are working on district heating plans. 2018 again shows a spectacular growth in the number of community solar projects. In total 450 of these project are operational, 173 more than last year. The solar power capacity doubled to 74,5 MWp and amounts to nearly 2% of all installed solar power in The Netherlands (most solar power to date is installed on the rooftops of individual households and companies). Citizens work together, start a cooperative and invest in solar panels on rooftops or in solar parks in their neighborhoods. These types of projects started in 2008 when the prices of solar went down and the energy market opened up to new small scale producers. More than 22.000 people have invested in community solar projects since that time, mostly in rooftop systems. The number of solar parks is increasing rapidly. The cooperatives have substantial stakes in 23 solar parks and are working on at least 27. For these larger projects carious local cooperatives often work together, also joining forces with commercial developers and/ or the municipality. All sorts of combinations of partners and also of ownership and financing constructions are seen. The famous Dutch ‘postcoderoos’, an energy tax reduction scheme for people living in a certain postal code area, has triggered innovation in that respect, this year leading up to the introduction of ‘Bouquets of Rozes’. The community movement triggered solar innovations before. In fact, the first solar parks in the Netherlands were developed by cooperatives (in 2012, 2015), when markets were still reluctant to invest in solar. Today, commercial developers are flooding the market with large scale plans, triggering local resistance. Citizen cooperatives are stepping in to ensure a controlled development with support of and benefits for the communities. In October 2018 the cooperatives of the Northern Provinces and the regional environmental movement jointly called for a community based approach in a joint Manifest for Solar Parks in the North. Municipalities are responsible for the permits have been taken by surprise by this rapid growth of and increasingly appreciate the community based strategy proposed by the cooperative movement and their partners. Almost 20% of all cooperatives engage in wind power development. As mentioned, the movement started with wind nearly thirty years ago, in the 80s and 90s. The cooperatives of the first generation are now realizing large scale project. In 2018 25 of 34 wind turbines of Windpark Krammer in the Southwest of the Netherlands connected to the grid. This ‘largest citizen led wind project of the Netherlands’ is owned for 51% by the two largest wind cooperatives, Deltawind and Zeeuwind. Effectively, this results in a rapid increase of cooperatively owned wind power, currently adding up to 159 MW, 40% more than last year and almost 5% of all land based wind turbines. The cooperatively owned wind turbines generate enough electricity for 120.000 households. More than 25 new community wind projects (150 MW) are progressing along the pipeline, likely to start production within two years. Interestingly, the spatial planning procedures of these project appear to take less time than with commercial projects which the initiators attribute to the cooperative community approach. By involving the community from the start and ensuring community voice and benefits, more support for the plan and less resistance was expected. This appears to be supported by practice. Even so, not all wind projects find sufficient support. in some areas people and municipalities object to wind energy, even when promoted by fellow citizens. The Netherlands has leaned on gas for many decades, but presently has to make a rapid shift to alternative sources for heat and fuel. The gas mining in the North is coming to an end, largely due to the earth quakes, partly as a result of depleting resources. In addition, the international climate commitments call for a transition to renewable alternatives. This transition to a gasless future greatly impacts society and affects all citizens. Increasingly citizens are organizing themselves, often also in cooperatives, to proactively search for alternatives and ensure sufficient community control and benefits. Small scale district heating systems with local heat sources are definitely on the table. In more than 17 districts citizens are initiating or participating in a planning process and research, often in close collaboration with the local municipality. Denmark is seen as an inspiration: here nearly 65% of all houses is heated by a district heating systems, of which 36% of production is consumer owned. Generating energy is one thing, ensuring that the energy is delivered at home is another. Local cooperatives joined forces to establish their own local energy supplier, a cooperatives of cooperatives with a permit to trade on the energy markets. Since 2013 two cooperatively owned energy suppliers have been active on the market: Energie Van Ons (‘energy owned by us’) and om| nieuwe energie (‘making the change to new energy’). Both were awarded the highest ranking as green suppliers in the Netherlands in November 2018. More importantly, revenues are returned to the local members. More than 130 cooperatives are member of one of these cooperative suppliers. Other cooperatives often work with the green commercial suppliers Greenchoice and Qurrent, Huismerk Energie and some others. The large wind parks, such as Krammer, sell their electricity directly to larger companies, effectively introducing citizen-to-business trade. This is unique in the The Netherlands. Als new and unique, is the introduction of a certified trade mark or label, Keurmerk MienskipsEnergie that serves as a quality guarantee for local and fair energy, i.e supported by and benefitting communities. This is good timing because the demand for local energy is increasing rapidly. In 2017 and 2018 municipalities have greened their procurement strategies and contracted cooperative suppliers for green and local energy. In the meantime, new innovative and creative projects are emerging across the country, also bottom up, citizen led and community based. The first biogas cooperatives were established in 2018, generating electricity from gas of land fill sites. At least 22 cooperatives organize auto sharing schemes, some also investing in electric charging stations in public areas. The first community storage projects have started, combining solar generation with large scale storage and a business case based on dynamic pricing, flexibility services and the balancing market, and the same accounts for hydrogen projects and wind power to gas. The citizens who are active in this movement never cease to come up with new plans an ideas. They carry on, maneuvering skillfully between existing laws and regulations, a stifling bureaucracy, vested interests and many other obstacles on the way. They prefer to work with municipalities and market but if need be they will carry on anyway. Ensuring their communities benefit, implementing yesterdays innovations and coming up with new innovations along the way. Simply by just getting to work. The infographic below shows the number of solar projects and the generated power per province. Click on the infographic to download and/or to enlarge. HIER opgewekt (‘generated HERE’) is the number one knowledge network for everyone engaged or interested in the local generation of sustainable energy, from the initiators and clients/members of energy cooperatives to collaboration partners such as municipalities, provinces, corporations, owners’ associations and service providers. These collaboration partners include sector organisation ODE decentraal, the government, municipalities and the grid operators. HIER opgewekt acts as a knowledge network in organising knowledge sessions, a yearly event and the publication of its annual Local Energy Monitor. Moreover, the organisation has a key position in connecting all parties within the field. HIER opgewekt gathers and generates information to support citizens who collectively generate renewable energy. For more information about HIER opgewekt or the Local Energy Monitor, please contact us.